We played at the weekend at Sheraton Hotel and he defeated me’’. He made light of the rumour that started after he was appointed coach of the senior national team. Many still believe that Okocha stabbed Oliseh in the back when he accepted the captaincy of the Eagles to the 2002 World Cup. ‘’We’re the best of friends and we played Tennis at the weekend’’, he emphasised. 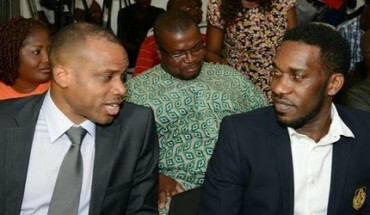 Okocha is currently the Chairman of Delta State Football Association and Chairman of NFF’s Study Group. Speaking on the Eagles, Oliseh said that he was going to make the Eagles to play team football combined with individual talents. ‘’If you remember our victories in 1994 and 1996, it was based on individual talents. But we do not have such individual talents again. What we need to do is to play collectively. That is what obtains in Germany and Spain. It’s a lot of hardwork. We’re here to do our best’’, he added.